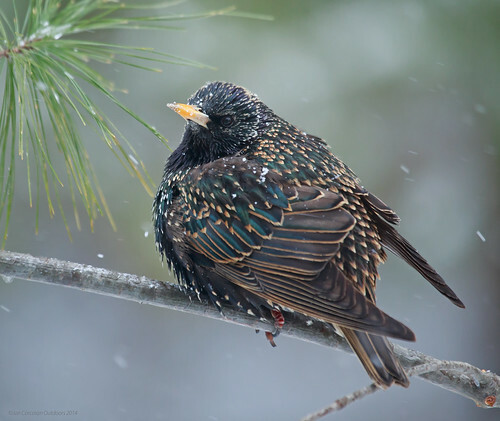 February 20, 2014 – There are seven starlings at the suet feeder this morning. I have seen flocks of starlings at cow feeder lots throughout the winter but not at my bird feeder. I wonder if these have strayed from the nearest cow lot or if they are early migrants. An honest inspection of one of the most disliked bird species in North America, the Eurasian Starling. Dunn, Robert R. 2006. The Pigeon Paradox: Dependence of Global Conservation on Urban Nature. Conservation Biology, Volume 20: 1814--1816. Johnson, Ron J. 1994. European Starlings. The Handbook: Prevention and Control of Wildlife Damage. Prevention and Control of Wildlife Damage. Linz, George M. 2007. 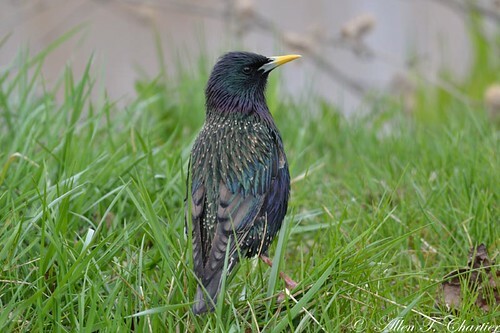 European Starlings: A Review of an Invasive Species with Far-reaching Impacts. Managing Vertebrate Invasive Species: Proceedings of an International Symposium. Nicholas Komar. 1999. 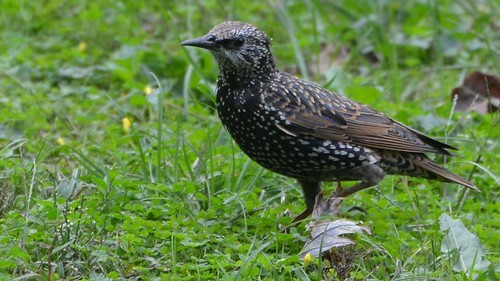 Eastern equine encephalitis virus in birds: relative competence of European starlings (Sturnus vulgaris). Am J Trop Med Hyg. ; Volume 60(3): 387-91. Thorpe, John. 1998. Review of 100 Years of Military and Civilian Bird Strikes. Proceedings of the International Seminar on Birds and Flight Safety in the Middle East. White, Randolph. 2005. 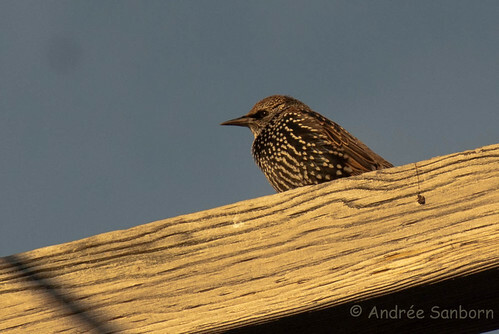 Compressed Air, Wooden Clappers, and Other Non-Traditional Methods for Dispersing European Starlings from an Urban Roost. Proceedings of the 11th Wildlife Damage Management Conference. www.keepturningleft.co.uk for more bird films. The starlings are an astonishing thing to see - Near Oxford - England. This was filmed at an RSPB reserve called Otmoor. It is the most remarkable thing I have ever seen - and as a video camerman I have seen some pretty amazing things. The music is from a companny called CSS Music. The track is "soaring with the sun" - . Hi, Dylan. I got your contact information from your beautiful YouTube video published in February 2007. Like drivers on a freeway, starlings dont appear to mind having neighbors nearby on their sides—or above and below, for that matter—as long as they have open space ahead. That makes sense, since the presence of a clear path in the direction of travel minimizes the likelihood of collisions should the birds need to shift their course abruptly, as is likely when a falcon attacks. But whats really nifty about this spatial asymmetry is that the researchers have been able to use it to calculate the number of neighbors to which each starling pays close attention—a quantified elaboration of Pottss chorus line idea. By looking at correlations between the movements of neighboring starlings, they can show that each bird always pays attention to the same number of neighbors, whether theyre closer or farther away. How many neighbors is that? Six or seven, says Cavagna, who points out that starlings in flocks can almost always see many more nearby birds— but the number may be closely tied to birds cognitive ability. The direction of the flock can be coordinated by each birds tracking six or seven other birds. Remarkable. This is a very different kind of cognitive skill. A family of European starlings is bathing. Young starlings just started flying from the nest. After a parent showed how to bath babies started bathing very carefully. Three young starlings have different personalities and courage. The bravest one (with a pine needle on the back) tries to fight with two adults (at the end of the movie). The movie was taken with Canon Powershot SD970 IS.